Ah…love this old tune from Electric Light Orchestra. It instantly came to mind after a call we received yesterday. A nice lady had been calling numerous cabin companies searching for a quick getaway to Beavers Bend. She’d stumbled across our website among “many others.” We were the first to call her back and others hadn’t for several days. There are tons of wonderful companies to do business with in Beavers Bend State Park. But if they won’t return your call promptly…don’t let it bring you down! 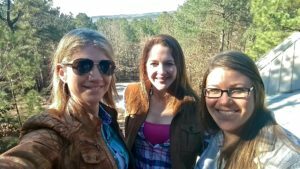 Call us at Mountain Vista luxury cabin near Broken Bow Lake. Unless we’re on an airplane, you’ll be surprised that we actually return calls and emails promptly. Many times people only need a one-bedroom cabin when visiting Beavers Bend State Park. There are plusses and minuses to choosing a small cabin. They’re cheaper. But usually smaller cabins in Broken Bow are located near many others. Tiny lots and scores of other tourists nearby may greet you upon arrival. When researching luxury cabins in Beavers Bend, pay close attention to how the property is displayed online. Make sure you see a large portion of the cabin property so you’ll know the lay of the land before booking. Some cabin companies are notorious for only showing a tight shot of the cabin online. When you arrive…it looks completely different. You’re often packed together like sardines. It’s a huge complaint many have when visiting Beavers Bend State Park. I heard a funny story recently; two honeymooners booked a cabin and didn’t realize they were near a noisy bar with live music. They couldn’t sleep and stormed into the bar to complain. They should’ve asked the cabin company why there was no mention of their rental being near loud outdoor music. Our weekends are filling fast at Mountain Vista. Several 2017 holidays remain available, but not for long. Mountain Vista sits on acres of seclusion in the upscale Southern Hills Addition. In the heart of the Kiamichi Mountains. There are lots of great cabins in the area, but few with a deck view like ours! If you follow these tips it’ll make your visit to Beavers Bend State Park much more affordable. 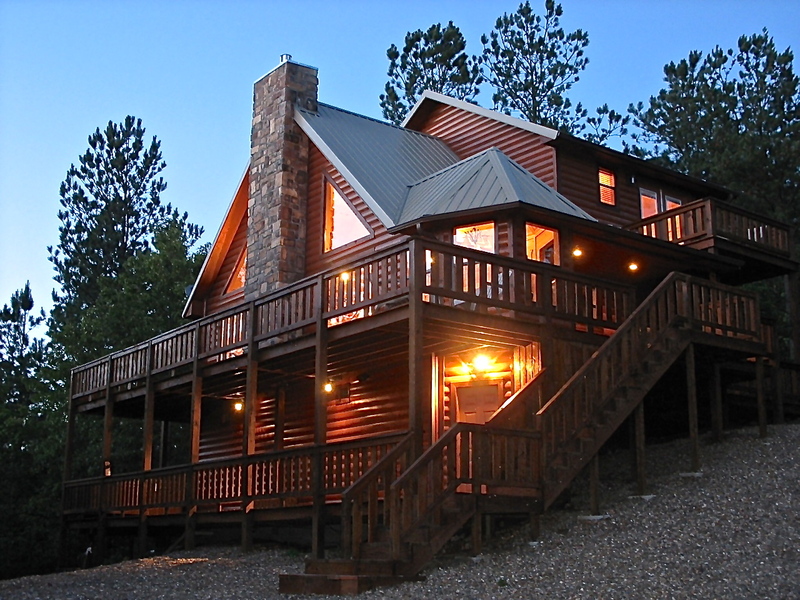 When you reserve with us at Mountain Vista, you’re dealing directly with the cabin owners. Not a large cabin management company juggling 30-80 cabins. Sherri, “Kula” (the grand champion show dog) and I invite you to visit our vacation home soon. 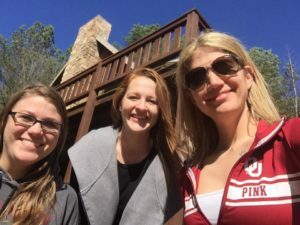 Contact us at BeaversBendVacations.com and we’ll help you plan an epic getaway to beautiful Broken Bow, OK.
Brown-O’Haver, a national public insurance adjusting company, hosted their corporate retreat at Mountain Vista recently. Alice Young oversees their Oklahoma operations and describes her time relaxing at Mountain Vista. The Brown-O’Haver staff traveled from Moore, OK and stopped in Antlers at the famous SpannMan’s BBQ restaurant. They later enjoyed dinner at Moon Tower Bar and Grill in Hochatown. We’re happy Alice and her team appreciated the serenity of Beavers Bend and our amenities at Mountain Vista. Many don’t realize the value of a public insurance adjuster. We’ve had the pleasure of doing business with this great company and have always enjoyed their professionalism. They’re truly experts in the public adjusting industry. Here’s how Brown-O’Haver can help you with an insurance issue. Thanks to Brown-O’Haver for choosing our vacation home for their corporate retreat! They should be your first call when dealing with a home or business insurance claim. If you’d like to host a corporate retreat at Mountain Vista in Beavers Bend State Park contact us. Cabin highway noise should be at the top of your list when researching luxury vacation properties in Beavers Bend State Park. Scores of cabins continue to be built in Broken Bow and many are near noisy highways. 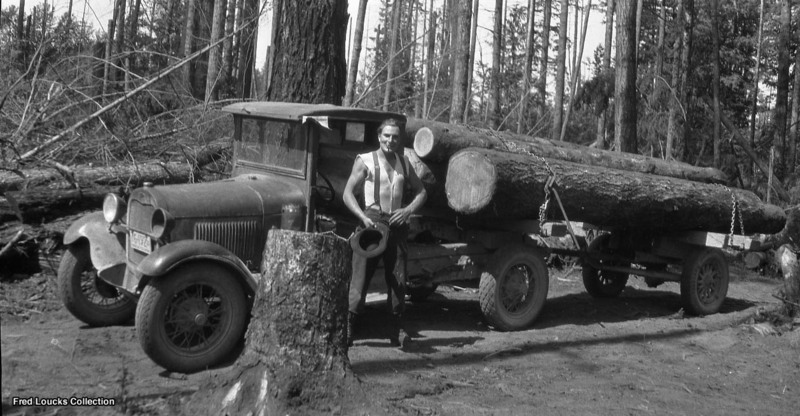 You arrive and are excited about a few days in a cabin and surprise…Larry the log truck driver is doing 70mph within a few yards of your vacation retreat. A few of the biggest disappointments visitors experience when arriving at their Broken Bow lodging choice are road noise and having another cabin nearby. How can you really be sure your cabin will be secluded away from Larry’s loud tailpipe? 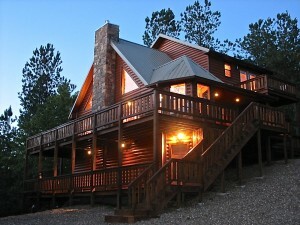 Mountain Vista luxury cabin sits on acres of seclusion…away from noisy highways and log trucks. Download our Beavers Bend app for VIP offers and a list of area attractions. A few dates are available in early March at Mountain Vista. Contact us if we can help plan your Beavers Bend vacation. 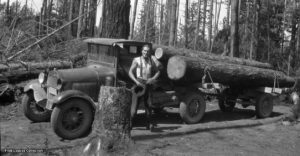 Ol’ Larry and his log truck won’t be in the area! You never have to pay Beavers Bend add-on fees for firewood, insurance, cleaning or hot tub usage at Mountain Vista cabin. Our busy booking season has arrived. Oklahoma spring break is packed but we have a few openings for many Arkansas and Texas school districts. President’s Day, February 20-22 is now available at Mountain Vista. This is always a popular date for those off work seeking a quick getaway. Download our Beavers Bend app for a complete list of area activities. The Broken Bow Lake Duck Tours will be open again in March. This highly popular tourist attraction offers great insight about Beavers Bend State Park. You’ll enjoy jaunting across the pristine water of Broken Bow Lake in this comfortable amphibious vessel. 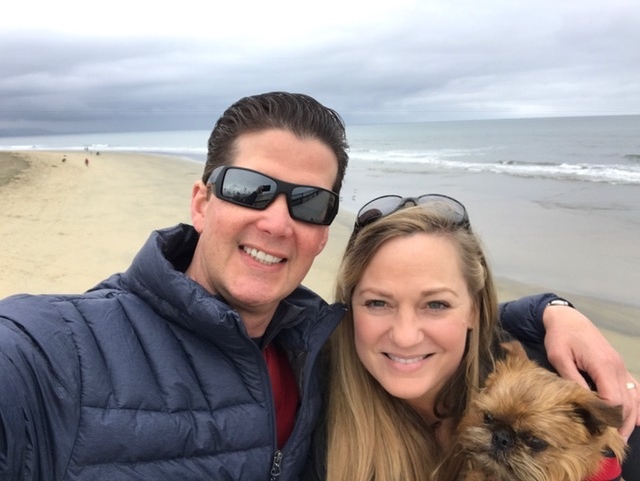 Sherri and I along with our very spoiled Grand Champion Brussels Griffon just returned from a week in Southern California. 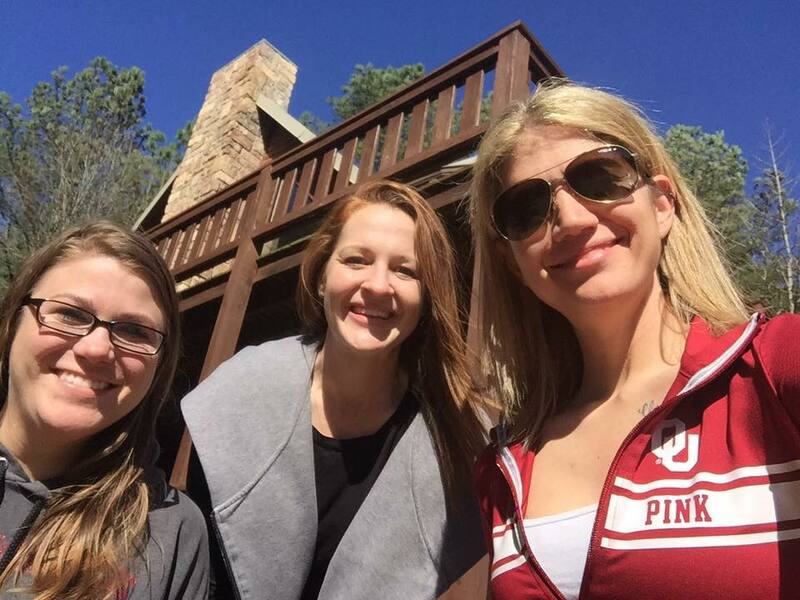 The weather was actually warmer in Oklahoma during the duration of our stay than at Newport Beach. Unlike many cabins in Broken Bow, you deal directly with us, the owners, rather than a large management company. I’ve noticed a dramatic surge in rental property interest in the past couple of months. If you’re considering purchasing or building a cabin in Beavers Bend and need consultation, let me know. I’ve written numerous articles you can find online about how to market luxury properties. We’re considering adding and marketing cabins on our website, social media outlets and app. Ask yourself if you’d like your cabin marketed by a company already overseeing 30-70 other cabins. How will you receive individualized media attention while competing with scores of cabins on a website? Contact us to reserve your stay at our Mountain Vista vacation home. There are many questions to ask Beavers Bend property managers before building or buying a luxury cabin in Broken Bow, OK. Stepping out of your comfort zone is sometimes difficult if you have no marketing or media experience. It’ll be worse if your cabin management company has limited digital and print marketing experience. Ask these questions before signing a contract with any property manager in Broken Bow. Do you personally inspect each cabin before guests arrive or leave it up to the cleaning crew to ensure the property is staged properly? Do you charge resort fees to guests and will I get all or a percentage of this add-on charge? Are you an expert in social media, printing and video production to help market my Beavers Bend luxury cabin? Show me examples. You have 30-50 cabins on your website. Tell me about your background with market segmentation to enhance my chance of renting consistently? How do you juggle owning a separate business along with marketing cabins? What is your background in mobile marketing? Will I get the names and contact information of each guest staying in my cabin if I wish? Will I see each maintenance invoice? Do you or the contractor markup maintenance fees on properties because it’s a rental? Do you show professionally produced videos of each property, including complete perimeter shots? Are you an expert in list, database and zip code marketing? Tell me about your background with this in large cities across the country. Do you publish a newsletter and blog? How many people read it? Will you charge my guests insurance fees? What percentage of this add-on fee will I receive? Do you personally own luxury rental cabins? Give me 10-20 of your cabin owners’ names as references. Start with these “Questions To Ask Beavers Bend Property Managers” and add your own. You’ll be a savvy luxury property buyer in no time. We created Beavers Bend’s app in conjunction with Mobile Roadie in Los Angeles. Thousands enjoy having access to VIP offers and information about Beavers Bend activities. Contact us if you have questions about building and marketing luxury properties. If you’re considering purchasing a cabin in Broken Bow, we can help with marketing, media and property management. Prestigious global leadership position within the publishing and printing industry…very proud of my wife! She even picked the perfect spot to build Mountain Vista cabin in Beavers Bend State Park! Sherri J. Isbell has been elected to be the next President-Elect of the In-Plant Printing and Mailing Association. Isbell will become only the second woman to lead the organization during its 54 years of existence. 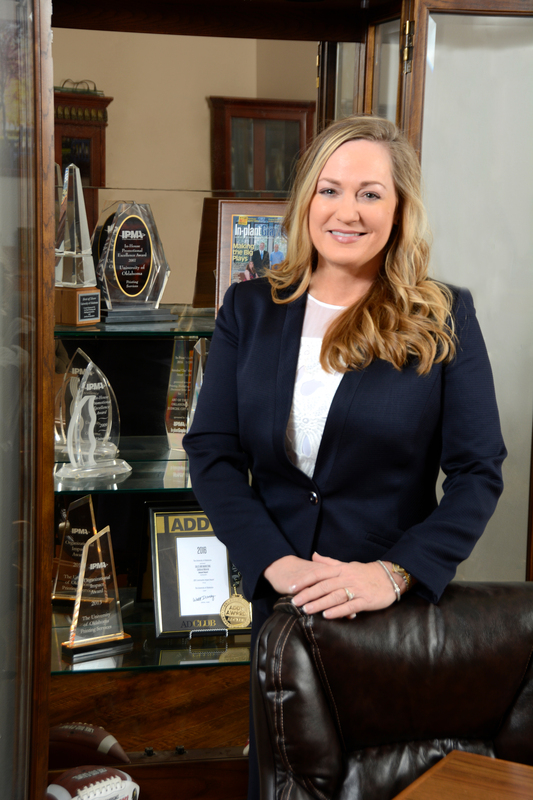 “Being part of an organization like IPMA and then asked to be its leader is a great honor. 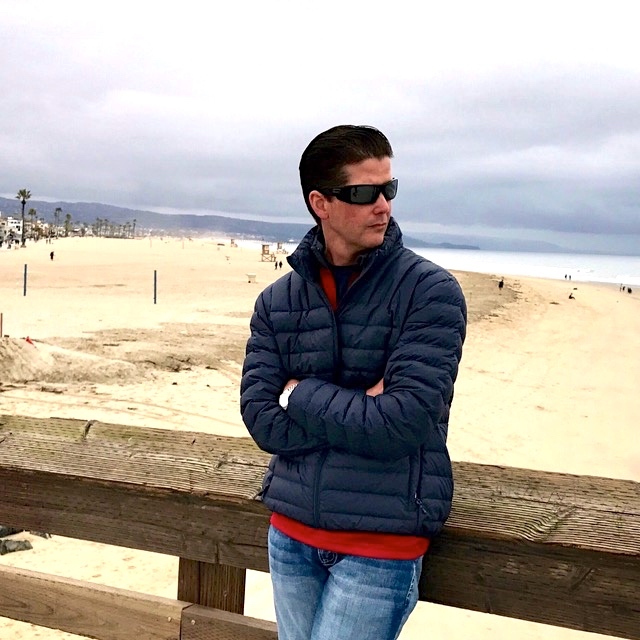 Over the years, I have had the opportunity to meet many wonderful people from a variety of industries all working toward the same goal of empowering in-plants. Now I have the opportunity to move IPMA forward.” Isbell said. Isbell is a member of the Senior Management team at the University of Oklahoma. Her tenure at the institution exceeds 25 years. She is responsible for the direction of customer service, specialty printing, mailing, marketing and supervises a large staff at multiple locations. 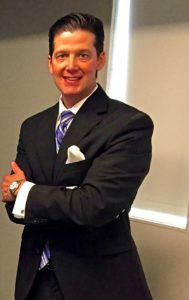 As an IPMA member for many years, Isbell has attended numerous conferences, served on several committees and held leadership positions at the national and local level. Currently, she is the Member Representative on the IPMA Board of Directors and the Vice President of the Oklahoma City Chapter. She was presented with the Outstanding Contributor Award for service to the association in 2013. Isbell is a founding member of the Franklin Stamp and Ink Society and is a Certified Printing Service Specialist conferred by the Society of Service Professionals in Printing. A graduate of the University of Oklahoma, she has made the customer service, sales, mailing and marketing efforts at Printing, Mailing and Documents Services one of the best in the country. The University of Oklahoma has been ranked as the largest University In-Plant over a dozen times and is the most award winning printer in the country with over 250 accolades. Isbell resides in Norman, OK with her husband Jerry and their show dog, Kula. When not working, she enjoys handling Kula in the show ring and has completed his AKC Grand Championship. We have special rates this week at BeaversBendVacations.com. Beavers Bend Spring Break cabins. We’re currently have availability March 1-10 and are booked on the 11th-18th. Peak reservation season is nearly here. At times we’ll book 15-20 nights per day beginning at the end of January. If you’re considering visiting Beavers Bend State Park in Broken Bow, OK during spring break, download our app. The Beavers Bend app will give you essential tourist information. We list everything from restaurants to fishing guides. Our app fans also enjoy VIP offers to Mountain Vista luxury cabin. 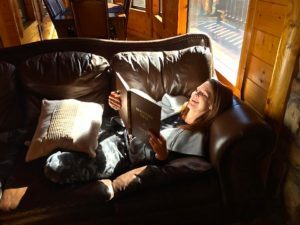 Remember to do your homework before choosing a luxury cabin in Broken Bow, OK. Website pictures are often deceiving and don’t indicate how secluded your cabin will be. Always ask for pics of the entire property before making your reservation. Pay close attention to add-on charges when researching cabins in Broken Bow. Many management companies mimic hotels across the country by adding resort fees. This is an extra charge for nothing…it simply pads their pockets. Other gouging techniques include incidental, insurance, cleaning, and hot tub charges. We never bill our guests these needless fees at Mountain Vista. Seek references when considering Beavers Bend spring break cabins. Ours are fantastic! Holidays are highly popular at luxury cabins in Broken Bow. Scores are unable to vacation in our area because they wait too late to book a cabin. Don’t wait too late to make your plans. 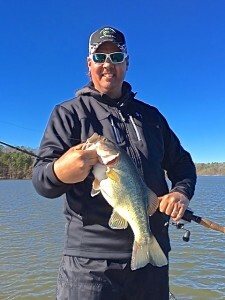 I visited with our favorite fishing guide, Bryce Archey of BrokenBowLakeGuide.com. He tells me bookings for the spring spawning season are going swimmingly. Bryce is the most popular guide in Broken Bow. I already have a few dates booked with him this year! There are a plethora of great cabins in Broken Bow. We have a tremendous advantage over many due to our fantastic 20-mile view and acres of seclusion. Make your plans to visit Mountain Vista soon and remember…we never charge add-on fees! Here’s our latest Beavers Bend Newsletter. Contact us if you’d like to join several thousand other Beavers Bend State Park fans that receive our periodic emails a few times per year.